Designer Saltmarsh Townhome! Neighborhood Pool! Great Location! 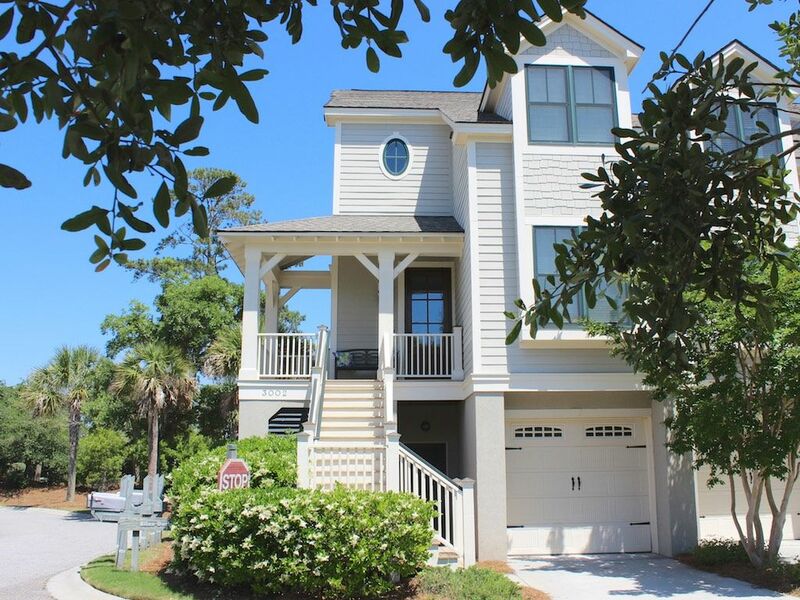 3002 Salt MarshFive Star Townhouse on Seabrook Island. Salt Marsh is Seabrook's newest development and is nestled in a natural marshland setting along a tidal creek of Bohicket River. Guests have access to a private swimming pool, putting green, and private dock extending 300 feet across marsh to a tidal stream. Enjoy the sunsets on the dock in the evening. This lovely townhome is a short walk to the tennis center, Lake House pools and fitness center, equestrian center, restaurants, shopping, crabbing and kayaking! Seabrook's pristine beaches are a bike ride away, and bikes are a phone call away. Located one mile from Freshfields Village and a short bike ride to the Lake House. Our beautiful town home is a three bedroom, three bath which sleeps six. It offers the latest luxuries: an elevator from the basement garage to all floors, high ceilings with fans, and large windows with beautiful views of the marsh. An expertly decorated interior has lovely and comfortable decor, hardwood floors, and over 2,000 square feet of very livable space. The inviting great room offers an entertainment center with 42" HDTV, DVD, stereo system, wireless Internet, books, and board games. The kitchen is outfitted with Bosch kitchen appliances and granite counter tops. The comfortable screened porch off of the great room has rocking chairs and table seating for six overlooking a lagoon with fountain and views of the marsh. The colorful first floor bedroom is a queen with private bath. The other two bedrooms are upstairs along with a spacious laundry room. The master has king bed, TV, and bathroom with Jacuzzi, double sinks and separate tiled shower. Another large bedroom has twin beds and private bath. The historic city of Charleston is a 30 minute drive, and Kiawah Island is a five minute drive. Seabrook Island boasts two championship golf courses, and the tennis center is close by, across from the Lake House. Guests have access to the private Seabrook Island Beach Club amenities which offer lovely dining inside and out, pools, fitness center and other island offerings. This is a wonderful getaway for families, or tennis and golf groups. Imagine riding horseback on the beach, kayaking the low country waters, biking to Fresh fields for morning coffee (on bike and walking paths), or having a sunset picnic on Seabrook's three miles of very private beaches. A full service management company will handle your check-in and out, housekeeping, and other services. Please, no pets and no smoking. Coastal Getaways of South Carolina has been handling the rentals of Seabrook Island properties since 2006. We represent homes, villas, cottages, and townhomes in a variety of locations, neighborhoods, and price points and can help you find the right place to ensure your trip to Seabrook Island meets your expectation. We pride ourselves on our honest, personal service. Roomy beautiful house with attention to details! We had a wonderful Thanksgiving celebration with family. The house was tastefully decorated and very well stocked. Would definitely return to this area and house. Place was lovely. We enjoyed our vacation. Everything was very nice and house was well equipped with all we needed. Seabrook is a beautiful island to vacation at. It was nice to have a choice on which pool we wanted to swim at each day. Only downfall was that there was construction across the street so almost every time we needed to get out of the garage the construction workers were in our way and we had to wait until they moved their vehicle. Otherwise, we would recommend this unit for a wonderful vacation. This property is delightful in every way. Well located near Bohicket Marina, Freshfields shops and upscale market. Our rental bikes had been delivered when we arrived. Home decor is pretty and all is scrupulously clean and well organized. We enjoyed the all cotton bedding. All island facilities are very nice. Be sure to walk out on the long community marsh dock and go to the beach. We came upon the distinctive tracks where a sea turtle had hauled herself up to the dunes to lay her eggs. We definitely recommend this villa. Always Love visiting beautiful Seabrook and Kiawah Islands! This year we stayed in the Gated Community of Salt Marsh on Seabrook Island. It is quiet beautiful neighborhood of townhomes. With a private pool for the community as well as all the amenities Seabrook Island has to offer. From the beautiful oceanfront Beach Club pool area, the Lake House, the Island House for golfers, and many more. And the proximity to Charleston can't be beat. We enjoyed our time at our townhome in Salt Marsh as well as on Seabrook Island. It was a wonderful week of family and relaxation. The townhome was very comfortable, and met our needs for the week. Having the elevator was a great convenience on the arrival and departure days. Working with Coastal Island Getaways was a pleasure they were very prompt and supplied all the information and details needed for the rental process from entry instructions, departure checklist, gate entry passes for the island. Great to work with! I am a 5th grader that has come to this nice villa every Spring Break. The inside is so welcoming. There is a porch that you can go and look at the pond for the alligator. There is a small pool over by the entrance of Salt Marsh. My family rides our bikes everywhere, we can ride to the market, restaurants, horse stables, and the tennis courts. There is also dock that you can walk to, to catch crabs. Let's just say that this villa is close to everywhere and everything. The interior of the villa is beautiful. The beds are so comfy. The dining room can fit 9 people, so if friends are in Seabrook, you can PARTY! You can use the elevator when you arrive if you have tons of luggage. This home is located so close to many of the area's fine amenities. Shop or dine at Bohicket Marina (.5 miles) or Freshfields Village (1.0 mile). It is a short bike ride to play tennis, ride horses at the Equestrian Center, or use the Lake House facilities (outdoor pool-no fees; indoor pool/fitness center-fees apply). Seabrook Island has 3.5 miles of beaches and 11 boardwalks from Oyster Catcher Court (North Beach) to Pelican Beach on the banks of the Edisto River. The Beach Club pools, club dining (Island House/Pelican's Nest) and golf are a quick car ride away. Amenity cards giving you access to the Seabrook Island Club's facilities: outdoor, oceanfront pools (seasonal), Pelican's Nest outdoor, oceanfront restaurant/bar (seasonal), Island House restaurants/bar, golf, tennis and Lake House indoor/outdoor pools and fitness center, are included in the rent. Additional fees are charged for all activities except outdoor pool usage.